Iran too is not accepting the economic sanctions easily and will dominate news whole of the year 2012 as its horoscope shows. Though doubted for the correct time, as Ayatollah Khomeini is said to have come into power and was, perhaps, sworn in earlier, the one horoscope that may be dependable is given here. Iran, a nation known in world history for its great culture and civilization, heroic tales that appeared unbelievable and noble deeds, is a Shia nation whose destruction is a wish of Sunni Saudi Arabia and also Israel with its own problems of being surrounded by hostile nations. In its present juncture of history, Iran is prepared to defy world’s mightiest power USA. Apart from the support of Russia and the sympathy of China, Iran stands isolated, almost like Israel. But Israel has the full support of USA and of some western European countries. Iran has to face USA, west European countries and hostile Sunni nations by which it is surrounded. Syria which can and might have helped it, has its own revolt, inflamed by the west, to face. These facts help us decide that in the dasha of Venus, like Pakistan which has now strained relations with USA, Iran is in an aggressive mood and has to face aggressive USA. It is well known and now confirmed that Iran has developed nuclear weapons to an extent that it can test fire nuclear missiles. This comes days after Iran threatened to close the Strait of Hormuz, a key oil export route, if new sanctions are imposed over its nuclear program . No wonder that in the present dasha of Venus comes the news. The immediate effect of this will be big rise in oil prices all over the world with India already suffering from rupee becoming weaker against dollar. The Saturn Jupiter axis along the twelve six axis of the Indian horoscope is offering no relief in this area and India’s foreign debt has increased enormously already. Further increase in oil prices in India will lead to greater price spiral. Coincidentally, while Europe is discussing the future of new nuclear energy after this disasters in Japan, there has been a disaster in a nuclear submarine in Russia, comes the news of nuclear Iran and the reaction of US and its threatened economic sanctions and possible armed confrontation. It is an election year in Russia with Putin seeking to become president and swap places with Medvedev and in USA president Obama will seek another term. The economic recovery in USA has been poor and the risk of involvement in a clash in any country will be unpopular. Yet USA cannot see a nuclear Iran emerge as a threat to Israel and its own precious interests. It has already armed Saudi Arabia with arms in fabulous arms deals which of course benefits it enormously. That does not solve the problem if Iran test fires nuclear missiles and USA will have to intervene provoking protests , mostly unpopular. Clearly a skirmish, not a war is in the offing. 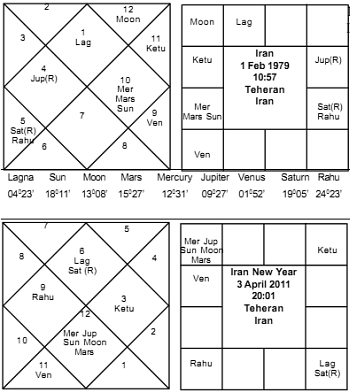 The New Year horoscope of 2011 (Chaitra Shukla Pratipada) of Iran shows a year of terrible aggression against it and by it with Kanya rising and five planets in the seventh house with Mars and Saturn in the lagna. We have our attention riveted on the fiasco of the Lokepal bill. Pakistan also in the dasha of Venus with Mesha lagna is facing Memogate and terrible strains in its relations with USA. A little further, Iran has become a flashpoint affecting the world and of course India. I will write separately on what I had already written about Pakistan. 18 November 2011, 6:05 AM - Saturn in the seventh house of Pakistan’s horoscope and Jupiter in the lagna in transit now, clearly shows, particularly in the mahadasha of Venus, the seventh lord, a very significant change in the top level administrative set up of Pakistan, affecting President Zardari and even the possible change in its foreign policy. That can be seen in detail later.